Hey y'all... a couple of weeks ago I put up a cool record by King Curtis called 8th Wonder. Well, I'm not sure if you've been following the comments on that post, but they developed into a very lively discussion. As if in some audioblogger's dream, British researcher and all-around King Curtis expert Roy Simonds weighed in with some interesting facts, and clarified a few things for us. 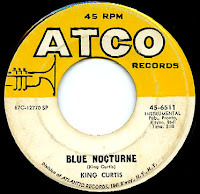 First off, he said that King Curtis was indeed a guitar player as well as a reed man, and was the guitarist on the 1962 Enjoy release Hot Potato by a group called the Rinkydinks. Oddly enough, that tune would be used as the initial theme song for a newly syndicated TV show called Soul Train in 1971. Ever the entrepreneur, Bobby Robinson changed 'Rinkydinks' to 'Ramrods' and re-released the song as Soul Train (Rampage 1000) in 1972. It would spend five weeks on the Billboard R&B chart that summer, climbing as high as #41... not bad for a ten year old recording! "...if this music makes you feel like you want to dance, or if it makes you feel like you want to cry, that music has Soul." I'm right there with that, man! According to Simonds' notes, that's Spooner Oldham on piano along with the usual American crew of Bobby Emmons on the organ, Reggie Young and Bobby Womack on guitars, Gene Chrisman on the drums and Tommy Cogbill on bass. Cogbill is also listed as a co-producer with Tom Dowd (which in a way is kind of odd in itself, as 8th Wonder was produced by Arif Mardin). Anyway, I think it's just a great record, and I wanted to share it with you. Also, in that last post I mentioned the Sam Moore solo album that King Curtis was producing when he was killed. For whatever reasons, Atlantic didn't release it at the time, and the tapes gathered dust in a vault somewhere for over thirty years. It was finally released as Plenty Good Lovin' in 2002 by an outfit called 2K Sounds, and I just picked up a copy. 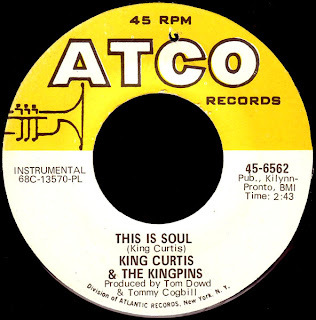 Let me tell ya something, with King Curtis producing and blowing 'dat horn and both Aretha Franklin and Donny Hathaway on keyboards, the record just COOKS! Get yourself a copy. You already know that I'm like 'Mr. Hyperlink', and all of that, but in the course of doing these American posts recently, I've found that there is virtually NO INFORMATION out there about Tommy Cogbill. No pictures, no biography, nothing. That's a crime. Hey, Red. Thanks for putting the period on the sentence for me about the Hot Potato/Soul Train situation. 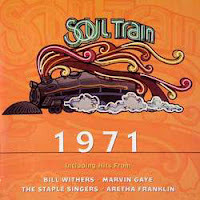 I happened to see a piece of "Soul Train" footage on YouTube where I heard the song and was just floored! I always thought that the MFSB cut was the first, but then again, I am only 38... Do you have "Cook-Out"? If not, stop by my page and pick up a copy for yourself... it's the least I can do since you were so helpful and all. Keep on fighting the good fight. Check with this guy about Cogbill. Hey, man, I review all the three of your music blog pages, and they are excellent sources for music and info. Keep up the OUTstanding work. Peace, brother. I REALLY DO appreciate the feedback, Foster, thanks again! Thanks for another wonderful post. 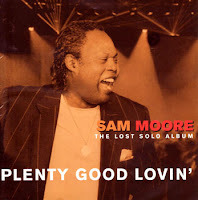 I have the Sam Moore "lost" CD from 2002, and like it very much, although mine is published by Swing Cafe (maybe because it is made in the EU?). I agree it's well worth buying. PS. Red, I agree Tommy Cogbill deserves more. Peter Guralnick's "Sweet Soul Music" has a photo of him with Elvis, says he played on nearly all the Golwax sessions, and describes his funeral (which sounds more like 1982 than 1972). Jerry Wexler's bio (Rhythm & The Blues) also has a few mentions. Hope this helps. "Hi Red -- I do have one really good web link -- an appreciation of Tommy by Nashville session bassist Michael Rhodes..."
Check it out, it's great... and lists Cogbill's passing as 1982 (My bad)... there's even a photo of Tommy and THE bass. Allen's going to try and do some further digging, and so will I. Thanks for the input, man, and keep it comin'... he was a very cool guy! Also, allmusic.com has a list of credits for him that is truly amazing. It includes Dusty in Memphis, among other things. And it says he died in Nashville Feb. 2, 1983; perhaps you can find an obituary from then. I have a single by Donnie, Fonnie & Lavorn called "It's A Sweet Love" (Trump PRO-6066 promo) which is produced by Tommy Cogbill. I've never been able to find any information about this, apart from the brief biographical stuff on the web. The only references to the record I've ever found are a couple of copies on sales lists. Do any of you know about this mystery disc? There's a sound file up on the UK-based soul source website (http://www.soul-source.co.uk/). Regards & keep up the good work! I am the singer, Donnie Harley-Hayes, who you hear on the song, "It's a Sweet Love". Consider this detail as to Moore's importance at the time: Donny Hathaway and Aretha Franklin playing keys on his records, but neither of them singing. How ballsy is THAT!